Taste test: These chips had a great crispness and were very crunchy, and to top that off, they tasted great with an intense sweet barbecue type of flavor. I was kind of intimidated by the "Roasted Red Pepper & Cream Cheese" name, as that just sounds like something far too sophisticated for me to eat, but I sure liked the way they tasted. The high level of crispness in the chips really brought out a very nice flavor. Smell test: A typical barbecue chip smell. From the package: “0 Trans Fat Low in Saturated Fatty Acids” ... “In the beginning there was kettle cooking and it was good. 150 years ago, potato chips were born as a gourmet food. Fresh potatoes were sliced thick, cooked in large kettles, then hand seasoned — 'The Thick and Crunchy Treat For the Elite.' Well, we decided to bring traditional kettle cooking back. 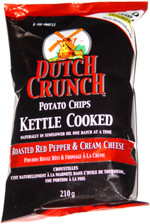 Dutch Crunch chips are kettle cooked naturally, a small natch at a time, in pure Sunflower oil. We insist on Sunflower oil because it has no cholesterol, which is good, and it cooks the chips to a perfect crisp, with no oily taste, which is great."